Explore Sorrento y la costa de Amalfi, declarada por la UNESCO, en esta excursión independiente de un día desde el puerto de Nápoles. Dirigido por un conductor experto, súbase a su minivan y deténgase primero en la pintoresca ciudad de Sorrento para explorar de forma independiente. 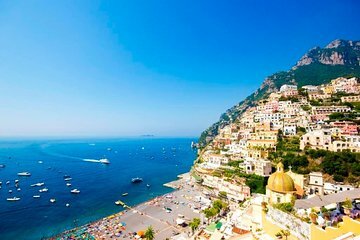 Continúe por la costa de la costa de Amalfi, visitando Positano, Amalfi y Ravello en el camino, con tiempo suficiente para comprar, comer y pasear a su propio ritmo. Disfrute de increíbles vistas mientras conduce por la costa de Amalfi, declarada Patrimonio de la Humanidad por la UNESCO. Conozca a su conductor en su puerto de cruceros en Nápoles, donde subirá a bordo de su minivan con su pequeño grupo. Diríjase hacia el sur hasta la ciudad de Sorrento, con vistas panorámicas de la Bahía de Nápoles. Disfrute de una hora de tiempo libre para pasear por la plaza de la cafetería de Piazza Tasso, visitar la catedral del siglo XV o visitar las tiendas locales. Después, reúnase con su conductor y comience el viaje a lo largo de la costa de Amalfi, una costa de 40 millas (64 km) salpicada de aldeas de color pastel y espectaculares acantilados. 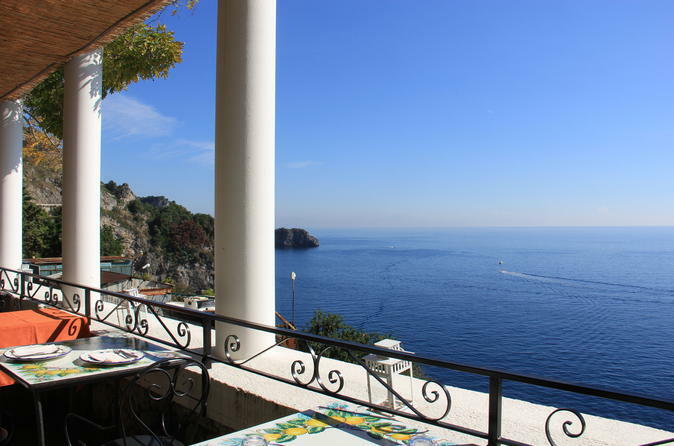 Viaje hacia la ciudad de Positano, con vistas al Mediterráneo y a los limoneros de la región que bordean la carretera. Luego, empápate de una hora en Positano a tu propio ritmo. Visite la iglesia de Santa María Assunta, disfrute de un café en una cafetería local o explore la elegante selección de tiendas. Continúe hasta la ciudad de Amalfi y tome otra hora para explorar a su gusto. Pruebe algo de comida del sur de Italia para el almuerzo (por cuenta propia) o admire la catedral de mármol del siglo IX. Tu última parada te lleva más alto en los acantilados, a la ciudad de Ravello. Considere usar su hora libre aquí para ver la Villa Rufolo (gasto propio) del siglo XIII, con jardines que ofrecen espectaculares vistas de la costa. Después de un día completo de exploración independiente, su viaje concluirá en el puerto de cruceros de Nápoles. Aseguraremos su regreso oportuno al puerto de Nápoles para esta actividad. En el raro caso de que su barco haya partido, coordinaremos el transporte al siguiente puerto de escala. Si su envío se retrasa y no puede asistir a esta actividad, su dinero será reembolsado. Vea nuestros términos y condiciones para más detalles. Muy recomendado..... lo repetiría 100 veces !!! The driver we had for this tour was absolutely horrible. We had an hour stop at each location which was wonderful but while in the van traveling to each location the driver would continue to drive as fast as he could and slam on the breaks everyone in the van had a headache after experiencing whip lash symptoms. While driving along the Almafi Coast the driver continued to try to pass busses and cars constantly honking and trying to swerve around them. We had booked 6 different tours with Viator, the other 5 tours were positive experiences but unfortunately we will never book again after this experience. We all felt our lives were in danger and told the driver so and he said too bad, this is how it is. We only got to the first stop didn't get to visit the other two locations as promised. Taken to a restaurant the tour guide suggested, sure he got a kick back. Tour was not worth the money we spent and didn't get to the locations as promised. Our driver did not have a good command of the english language which made it difficult to get the most from the tour. the tour was a lot of driving on very congested roads and one stop had to be eliminated. We had to rush back to get to the ship before sailing. All-in-all if rated as a less than enjoyable tour. This was a nice tour overall. Our driver picked us up from our cruise port. We were in a nice minivan with two other couples. We had two hiccups. When it was time to eat lunch he wanted to take us to one specific place, but we wanted more choices. One of the passengers thought that he had a relationship with that particular restaurant. When we voiced our concern he took us to a better place that had several choices of restaurants as well as many places to buy souvenirs. The driver gave us a specific time to meet us at the meeting point and he was about 10 or 15 minutes late. We didn't know if he was late because he was upset with us for not going to his preferred restaurant or if he ran into traffic there was a lot of traffic in the area. He didn't apologize for being late or give us an explanation. Overall I enjoyed the excursion and I would do it again if I am Italy again. We decided to try this tour based on all the wonderful reviews and not being impressed by the cruise ship tours. All I can say is it was Wonderful. Our Driver, Marlo, was wonderful, knowledgeable and personable. He was promptly on time and waiting for us outside our ship. He took us to Amalfi, Sorrento, Positano and Ravello and made sure we knew where we were going and was promptly waiting for us at the agreed upon time. Please do be aware that this trip does involve a lot of traffic time but the time in traffic went by quickly because the sights were so beautiful.Marlo and his tour group continuously kept in contact to avoid traffic wherever possible so we could spend the most time in each place. His expertise in driving was amazing as the roads are very windy and narrow and have to be navigated professionally. He and his crew rimed everything perfectly to make sure we were back in time to catch the ship. I can't say enough wonderful things about Marlo and this tour. Please be sure you take this tour whenever you are in Naples. Alberto was great as a tour guide and especially a driver along those narrow and winding roads. The highlight was the impromptu lunch just before arriving in Almafi. The food was fantastic. All the views were amazing. Highly recommend this tour. We were docked in Naples from 7AM - 6PM, last boarding at 5:30PM. We were met by our driver right on time outside of the cruise terminal. The van was comfortable, and a total of 8 passengers (6 of us from the same cruise). We had a fantastic day with stops in Sorrento, Positano, Amalfi, and Ravello. In between Positano and Amalfi our driver took us to a little restaurant for lunch (not included in price) and we had a delicious meal. He stopped at picturesque lookout points along the drive and gave us a few minutes to take photos. We fully enjoyed the day and were back at the cruise terminal by 5:15PM. This was a highlight of our trip and a great way to spend the last port day on our cruise. Highly recommend.